According to a recent update on the story in the L.A. Times, the 44-year-old victim, Kristin Kirk, dialed 911 shortly after her husband came bursting through the door, gesturing wildly as he started ranting about the end of the world. He then climbed out of a first-floor window. Then he climbed back in. Then he lay for a while on the bedroom floor, asking for someone to kill him. But then suddenly, he got a gun out of the safe. Her three young children nearby, hovered together in a corner, listed as their mother told the 911 dispatcher her husband was taking out a gun. They heard her beg him to stop. She told the dispatcher she had nowhere to go. Her 49-year-old husband pulled the trigger on the pistol. With that one single gunshot, she was killed instantly. Her 49-year-old husband was arrested on a charge of first-degree murder. Prosecutors say the two had been wrestling with marital problems, and that was the real reason Richard Kirk shot his wife. But now, in this civil lawsuit, the children (plaintiffs in the case) assert the maker and distributor of the recreational marijuana-infused candy are to blame for what happened that day. The lawsuit contends the defendants failed to warn customers that consuming these products could lead to psychosis, paranoia and hallucinations. 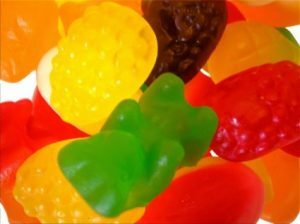 These potent candies, the lawsuit contends, were packaged with no instruction, directions or recommendations regarding proper use or consumption. Failure to reveal the dosing information from buyers was a reckless and negligent act, plaintiffs allege, that was intended to boost profits while putting users like Richard Kirk at risk. The lawsuit made it a point to assert that even manufacturers of dog foods make sure to list out all the ingredients, recommended portions and any relevant warnings. Legal analysts are looking at this marijuana lawsuit as a growing pain of a burgeoning industry. To start, marijuana companies are really now for the first time seen as large enough to see – and actually recover damages. That alone can prompt litigation. Beyond that, the labeling issue isn’t one that has been clearly sorted out. For a very long time, marijuana did not require labeling because it was sold underground. Drug dealers on the street didn’t worry about product liability lawsuits. But now that these products are sold under brand names from legitimate providers, the expectations are much higher. Whether this particular lawsuit is viable remains to be seen, but law experts interviewed by the Times called it, “a long shot,” noting that we generally don’t hold alcohol manufacturers liable when people get drunk and driver or get drunk and are violent to someone else. Richard Kirk reportedly ate a candy that contained more than 100 milligrams of THC. However when he was tested the night of the homicide, he reportedly had about half the legal limit of what would qualify for marijuana impaired driving.